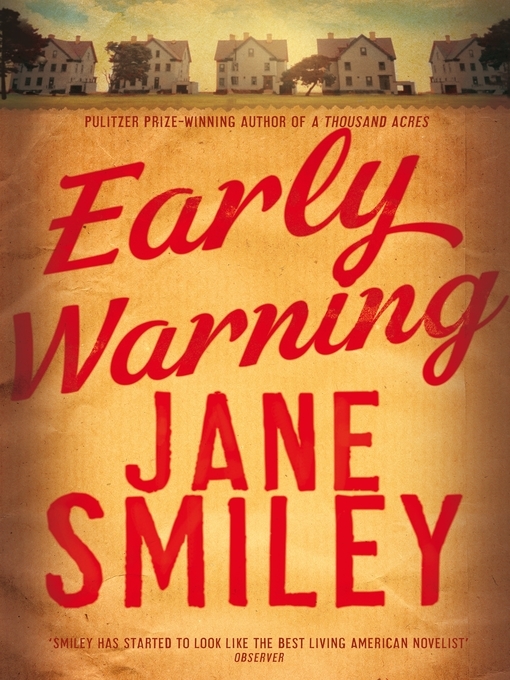 Early warning : a novel / Jane Smiley. Material type: BookPublisher: New York : Alfred A. Knopf, Edition: First edition.Description: 1 online resource (475 pages).Content type: text Media type: computer Carrier type: online resourceISBN: 9780385352437; 0385352433; 9781743537572; 1743537573.Other title: Early warning.Subject(s): Rural families -- Iowa -- Fiction | Social change -- United States -- History -- 20th century -- FictionGenre/Form: Domestic fiction. | Historical fiction. | Electronic books.Additional physical formats: Print version:: Early warning.DDC classification: 813/.54 Online resources: Click here to access MontanaLibrary2Go title or place hold | Excerpt Click here to listen to an excerpt of this title | Image Summary: Family patriarch Walter Langdon has died, and his children have fanned out across the country. The narrative moves year by year from 1953 to 1986, encompassing Cold War blinkeredness, Sixties rebellion, and escalating wealth into the Eighties. Early warning / by Smiley, Jane.